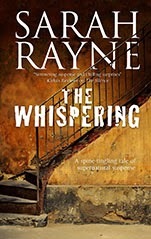 The Whispering is the fourth in Sarah Rayne's ghost series featuring Nell West and Michael Flint. This time Michael Flint is researching the music and poetry of the Great War; in particular how music influenced their individual outlook and work. I studied WWI poetry at university, so it was wonderful for me to see the names of Robert Graves and Siegfried Sassoon frequently mentioned. I wish Wilfred Owen could have played a role in the story but that might have been asking for too much. Michael is also researching the origins of the Palestrina Choir: a girl's choir based in a convent that sang behind a rood screen to hide their 'deformities'. Girls who were crippled, malformed or simple were left at the convent by their parents, joined the choir and created angelic music but could never be seen. Here's a quote from The Whispering about the origins of the long-dead choir. The Palestrina Choir was "..formed in an ancient monastery in Belgium in 1900 to commemorate the start of the new century, and was named for the sixteenth-century composer of sacred music." I was fascinated by the choir, and Michael visits Fosse House to meet reclusive Luisa Gilmore as part of his research but ends up discovering more than he bargained for. Meanwhile, Nell is researching the origin of the Holzminden sketch, a drawing that Michael finds in Fosse House, and which could be a sketch made at a WWI prisoner of war camp. The Whispering is nicely layered and I enjoyed having Michael as the protagonist this time around instead of Nell. There was an important reveal at the end that I had incorrectly predicted, and for me that's a sign of a great read when the plot carries you in an unexpected direction. The Whispering can be enjoyed as a stand-alone and is recommended for readers who like a good ghost story, or the idea that the past can bleed into the future and vice versa.